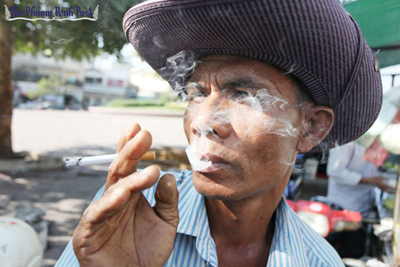 PHNOM PENH, 30 May 2016: Cambodia will ramp up effort to end smoking in public places by imposing fines on both individuals and businesses, effective this September. Phnom Penh Post reported that the Ministry of Health will run a campaign to explain recent legislation that bans smoking in public places. Once the campaign ends the law will be strictly enforced against smokers and establishments, mainly restaurants and hotels. Fines will be imposed from 16 September. Under the sub-decree, approved in March, establishments will face a USD12.50 fine if they fail to put up no smoking signs, or they provide ashtrays for customers. Smokers will be fined USD5. The ministry issued a statement, last week, requiring managers and owners of establishments to display signs in clear view to their customers. The signs must be written in Khmer, or English and must specify the fines. The decree is based on the law on tobacco control, which was passed by the National Assembly in March. It bans the consumption of tobacco products at the workplace and public areas, such as restaurants, hotels and on public transport. It includes smoking and chewing tobacco. According to the latest WHO statistics, there are close to 2 million tobacco users in Cambodia, of which 1.5 million smoke cigarettes, while the balance chew tobacco. The latter are guilty of spitting the residue into ashtrays ,on street pavements, on the floor of buses and even out of the open windows of cars and taxis. Last year, the kingdom welcomed 4.77 million international tourists up 6.1% from 4.50 million visits in 2014. The top 10 supply markets were Vietnam, China, Laos, South Korea, Thailand, the United States, Japan, the United Kingdom, Malaysia and France.